Denny’s Taegukgi bestowed by King Gojong to be exhibited. August. 11, 2018 07:16. by Won-Mo Yu onemore@donga.com. The oldest remaining “Taegukgi,” Korean national flag, registered as heritage No. 382 by the Cultural Heritage Administration, will be open to the public at a special exhibition to celebrate the 73rd anniversary of the Liberation Day. 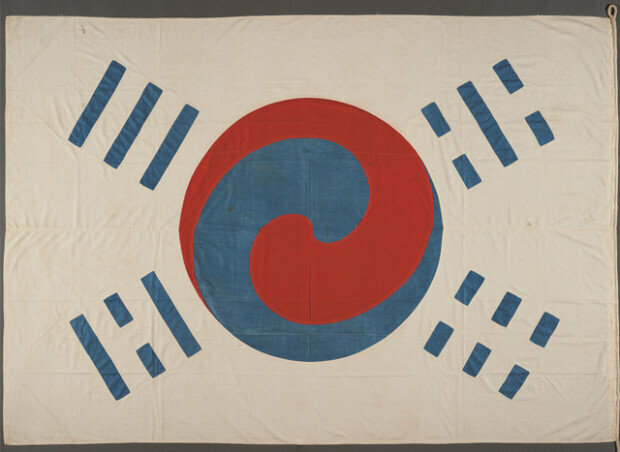 The National Museum of Korea said Friday that “Denny’s Taegukgi,” a national flag that King Gojong, the 26th monarch of the Joseon Dynasty, reportedly gave to his U.S. diplomatic adviser Owen N. Denny (1838-1900) in 1890, will be presented at the exhibition held from next Monday to Sunday. Denny was appointed as King Gojong’s adviser in 1886 upon the recommendation of Li Hongzhang, diplomat of the late Qing Dynasty. Denny not only helped the monarch in dispatching envoys to countries that were having a diplomatic relationship in 1887 but also actively engaged in arranging the Russia-Korea Treaty in cooperation with Karl Weber, Russia’s consul general to Korea. He even put his signature on a treaty document as one of Korea’s representatives. Yet, being in the doghouse with the Qing Dynasty, Denny was expelled from the position in 1890. King Gojong apparently expressed his gratitude to him by bestowing a national flag, which is to be specially revealed to the public. Made by two sets of cotton clothes pieced together, Denny’s Taegukgi is 263 centimeters wide and 180 centimeters high. Taeguk, a yin-yang symbol at the center of the flag, was sewn with red and blue clothes, and four black trigrams look similar to those of today’s flag. Denny’s Taegukgi had been kept by his descendants until it was donated to the National Museum of Korea in 1981. It was registered as a cultural heritage in 2008 ahead of the Liberation Day. Returning to his home country, Denny wrote a book called “Qing-Korea Theory” based on his experiences in Korea. Considered a valuable historical record for modern history, the book, based on a modern international law theory, denied a claim that Joseon was subject to Qing, and frankly described the tyranny of Qing in Joseon.